POCUS Evidence Atlas - ocular eye and orbit. intracranial pressure. EBM review and resource of POCUS for echo diagnosis. Sensitivity Specificity positive and negative likelihood ratios. This was a small systematic review (n = 201) that evaluated the utility of emergency department (ED) performed ocular ultrasound. A total of 3 studies were included in the final analysis and overall the data was low risk for bias. Operating characteristics were not pooled. Among the 3 studies included, there was not a clear definition for a positive test result. In one of the included studies, no positive test definition was provided. These results should be interpreted with caution given the small number of patients included and the operator dependent nature of this POCUS exam. A more recent study with larger variability in operator experience suggests the all-comer sensitivity may be much lower. 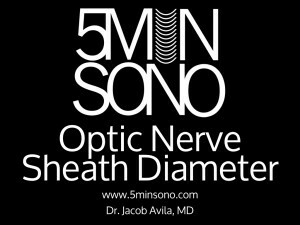 This was a systematic review, which including 12 studies (n = 478) using ultrasound measurement of optic nerve diameter (cut point of 5 mm for adult studies, 4.5 mm for age 1–17 years, and 4 mm for age <1 year) to evaluate for increased intracranial pressure (ICP). There was moderate to high heterogeneity among these studies given multiple patient populations. This resulted in wide confidence intervals: sensitivity of 95.6% (95% CI, 87.7%–98.5%), specificity of 92.3% (95% CI, 77.9%–98.4%), positive likelihood ratio of 12.5 (95% CI, 4.2–37.5), and a negative likelihood ratio of 0.05 (95% CI 0.016–0.14). It is also important to mention that the gold standard in this review was CT, which is not as accurate as invasive ICP monitoring. Overall their conclusions were that ocular sonography had a very low LR- (0.05) making it a good test for ruling out raised ICP in a low-risk group, and a high LR+ (12.4) making it a good test for ruling in raised ICP in a high-risk group. For more evidence check out our friends at US G.E.L.